Look at the fabulous things I got for my birthday last week! Alex took my non-subtle hint and tracked down that Pantone mug at Chicago's Sprout Home. Awww. I'm also now the proud owner of this gorgeous lasercut wooden pendant by molly m designs and this comfy graphic shirt by SkunkFunk. If you like clothes, check out SkunkFunk's collection. They use eco-friendly fabrics, and their website makes me want everything. These last two items are from P+L Boutique in Chicago, a friendly shop I discovered recently. They tie up their packages with orange ribbon and slip them into orange polka-dot bags, so of course I was charmed. I also received exotic gifts from the orient: the Japanese movies Dolls and Departures , and a kitchen sponge shaped like an orange. Life doesn't get much better than that. Happy Birthday! The sponge is V cute! I love Pantone mugs. I want to collect them all and make a shelving unit for them, so that I have a mug pantone chart! Happy Birthday! I LOVE the necklace! And Departures is an excellent movie!!! Hmmm... did you forget something? Bracelet! I thought of it in the shower and then forgot when I did the post. I'll remedy that! The shirt and the pendant look like your logo! Coincidence or planned? Mom, I tried taking a picture of the bracelet but I was defeated. It's too hard to photograph and clip out that woven metal, and I don't have an extra couple hours. But I love it! so glad you got the Pantone mug! Hope you had a great birthday! Happy Birthday! Thanks for a great blog. I always enjoy it. Belated happy birthday jessica! You are indeed a lucky girl! congrats on the amazing gifts... happy B-Day! Happy Belated Birthday. Would I be weird if I say my favorite of your presents was the silly sponge? It just made me smile. I'm loving that Pantone mug! That Alex is one smart cookie! And those are all awesome, but I'm dying over the orange sponge - how freakin' adorable. Not sure I could ever use it, but I'd let it sit on my sunny windowsill to make me happy on gray days. I know; isn't the sponge cute? The back side is yellow with a scrubby texture for pots. But I'm worried his face will wash off over time That would be sad. wow! happy belated birthday! you got wonderful gifts! I have watched the Departures and i must say it's one of the most insightful movie about death i've ever watched! it's amazing! Happy Birthday! I plan on getting my best friend that Pantone mug for her birthday too! I LOVED the film Departures!!! I meant that as a sort of tongue-in-cheek, kitschy phrase. Is it offensive? I have lots of Asian and Asian American friends. I will ask them! I'm curious! Great gifts! Glad you had a super birthday! AND you were visited by your folks too. heey, a late happy birthday from me ! :) may you be as resourceful, imaginative and wonderful as you were up to now ! I clicked on your blog with Livie beside me and when she saw that sponge she said, "Happeeee!" It is a happy little sponge, isn't it? 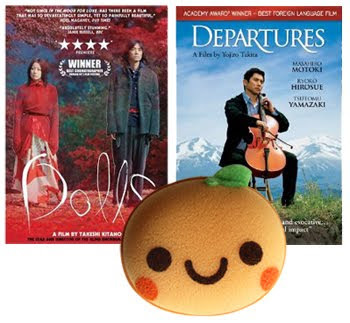 I love Departures - an amazing movie and I gave my friend's little boy a sponge in the shape of a bunch of bananas that I bought in Japan! Interesting to read others' comments about my DVD gift! There are many many movies and animations that I would like you to watch, but most of them don't have subtitles, or have the Region problem... My family is in love with Korean dramas these days and spend a lot of time to catch up. About the world "orient", for me as a Japanese, there is no problem. I know it's controversial, but we were taught Japan was called "Sun Rising Country" in 7th century. Well, a long long time ago, so do not try to argue about it with me, please!!! I'm a pacifist.